Tempe DUI lawyers at The DUI Team have been defending clients for many years. The National Academy of Criminal Defense Attorneys has named Brian Sloan of The DUI Team one of the Top 10 criminal defense attorneys for DUI related offenses in Arizona. According to NACDA, the very few Tempe DUI attorneys (less than 1 percent) who are good enough to make its Top 10 list have demonstrated an extraordinary amount of knowledge, skill, experience, expertise, and success in their practice of criminal defense. Garnering recognition as a Top 10 attorney by the academy is a tough process. 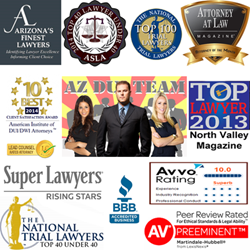 The Tempe DUI attorneys that make the NACDA list must first be nominated by a licensed practicing attorney. Then, NACDA’s research staff verifies that the attorney meets the minimum requirements of membership, which includes practicing for at least five years in criminal and DUI defense. Then, the attorney must be one of 50 attorneys chosen to advance to the final selection stage by the NACDA processing committee. Finally, the attorney must be selected by the NACDA Board of Governors as a “Top 10” attorney. The Tempe DUI lawyers at The DUI Team have more than 10 years of legal experience defending the rights of the accused and they proudly defend the rights to liberty and compensation of their DUI defense clients in Tempe. The DUI Team also provides their clients with experienced Scottsdale DUI lawyers. “If you have been charged with a DUI it is important to hire an experienced attorney very quickly. That is the best way to avoid the most severe punishments if possible. We have been defending our clients from DUI related charges for a long time and we understand how the system works,” says Brian Sloan. People who need to speak with an experienced Tempe criminal defense lawyer are encouraged to them now for a no cost legal evaluation of their case from an experienced member of The DUI Team.